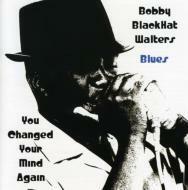 Bobby Blackhat Walters, blues harmonica player, vocalist, and songwriter hails from Cleveland, Ohio and has been playing harp for over 30 years. After retiring from the U.S. Coast Guard, Blackhat started taking his harp seriously and has studied with Dennis Gruenling, Phil Wiggans, Johnny Sansone, and Allen Holmes. While a member of the Black Rose Blues Band he had the honor of opening for Blues Legends B.B. King, Taj Mahal, and Steady Rollin Bob Margolin. Blackhat has shared the stage with Kenny Neal, Bill Deal and the Rhondels, Jason Ricci and New Blood, Eddie Shaw and Wolfgang, and Ruthie Foster. I bought my first harp after hearing Lee Oskar play with WAR in 1972. The sound of his harp just mesmerized me and I knew right then and there I was going to be a harp player too. Blackhat has been voted the MEONA 2003, 2004, 2005, 2006, 2007 Harp Player of the Year; 2004, 2005 Blues Entertainer of the Year; 2007-2008 Portfolio Weekly Magazine Blues Award Nominee and in 2006 added credits to his resume when he participated in History Channels documentary film Sherman's March to the Sea. The Band: Bobby BlackHat Walters- harmonica, vocals Larry Berwald- lead guitar Von Jose Roberts- bass Mark Hopkins- acoustic guitar Marty Germain- drums Tommy Fisher- keyboards Jackie Scott- backup vocals His latest reviews: From Greg Th Professah Versen of Blues Valley, WMRA-FM, Harrisonburg, VA. Th Prof writes: The latest release by Bobby BlackHat Walters and his band is one blues lovers will want to check out. The CD was recorded in Virginia and has a good representation of Virginians among the band members, which is pleasing to me as a Blues DJ Virginia's Shenandoah Valley. The CD's nine tracks offer the listener a mix of upbeat and downbeat tunes. The opening and title cut, You Changed Your Mind Again, will get your toe tapping if not your whole self out on the dance floor. Put Your Red Shoes On shows the virtuosity of Virginia Larry Berwalds slide guitar work as well as Walters' harp and vocal talents. I was pleased to see one of my favorite blues tunes included on the release: Sonnyboy Williamson's Help Me. On this track, the band gets down into the gut-bucket end of the blues continuum. For a trip down a hot, dusty Mississippi Delta road, Please Give Me a Clue is the vehicle to take you there. The slow pace of the music is reflective of the pace of life in July and August deep in the Delta. I Hear Mama's Voice is a plaintive cry that reeks with the deepest blues. The last track, Grim Reaper, takes the listener down a dead end road. Walter's mournful harp set's the perfect tone on this track. You Changed Your Mind Again is a release that blues lovers will want to check out. Greg Versen Professah Blues Blues Valley WMRA-FM Harrisonburg, VA Streaming on Saturday nites 8-1 am @ wmra.org From Przemek Draheim of Blues PL review- With tons of blues-rock CDs being released recently it is a pleasure to listen to some real, down-home blues played with a classic ensemble approach. No killer guitar solos here, no fusion harmonica sounds, just the blues played with grit and deep understanding. Bobby is a strong front man and his harp playing brings to mind those classic players from 1950s and 60s. He can make people moving with his faster numbers but the ones where he really shines are two slow blues numbers close to the end of the CD, especially I Hear My Mama's Voice, this set's highlight. For classic blues lovers this is a CD to have! It will be my pleasure to feature this album music in my shows. PD See Peter Blewzzman Lauro, Blues Editor's full review.